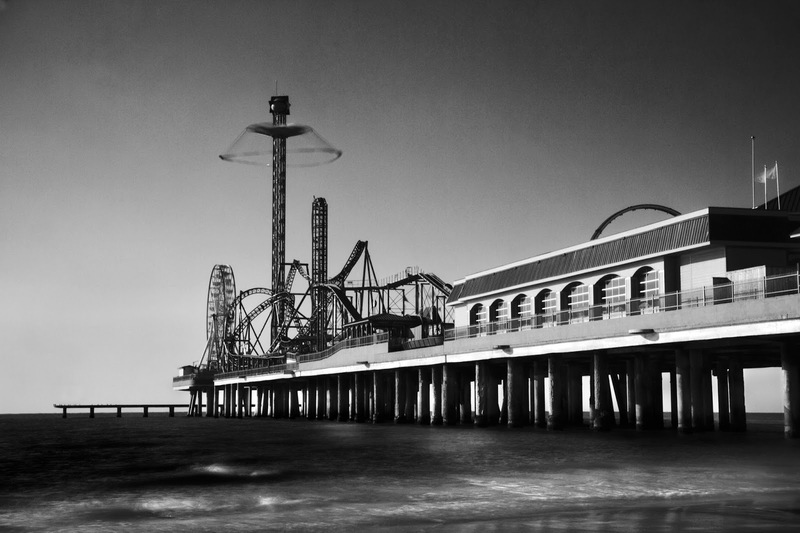 Clayton Gardinier Photography: Images of the Pleasure Pier, Galveston, Texas. Images of the Pleasure Pier, Galveston, Texas. This image was taken of the Pleasure Pier on March 2, 2013 at 9:00 AM. They were testing the various rides at the time and I wished to capture the motion of the rides, flags and waves. The image was taken using a Canon EOS 7D and a 17-55mm zoom lens, neutral density filters and a tripod. The image was processed in Adobe Elements 9 using Nik Software: Silver Efex Pro 2.